Moose! We spied a yearling bull, who was sporting stubs for antlers. He was in the water feeding on (and obviously enjoying) the fresh spring greens in Sandy Stream Pond. 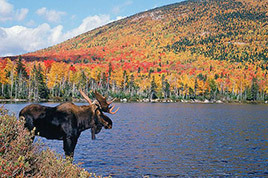 Whether you’ve seen a moose one time or a million times, it never gets old. Baxter State Park was lit up with vibrant greens of Spring and the views were spectacular today.